It’s winter time here in Albany and since it gets mighty cold around here, I’m focusing on winter beers. Winter beers are usually more full bodied, with some spice or sweetness in their character. Stouts and porters make for great beers to sip by the fire or with dessert after a heart meal of soup or stew. These styles are great nightcaps for the winter. 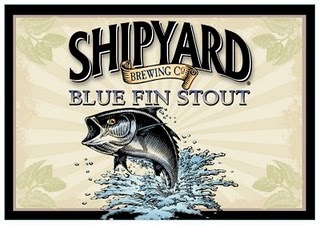 Tonight’s beer comes from Portland, Maine, another semi-local brew from the Shipyard Brewing Company. Aroma: Great nose of chocolate and coffee, well balanced between both. Appearance: Poured thick with a very small head. Dark brown/black. Mouthfeel: Full bodied, coats the mouth well, almost a residual coffee graininess after you swallow (but this isn’t a bad thing, it’s like eating chocolate). Less creamy than other stouts (again, not a bad thing). Overall: A really nice stout, good flavor and aroma. I love the mouthfeel, it makes you realize you are drinking something with substantial character and ingredients. Very different from a Guinness, although they are both technically the same style. A good winter beer, would pair very nicely with a chocolate cake or cookies.